You can aid in your students’ understanding of Hebrew history by purchasing this student video kit. 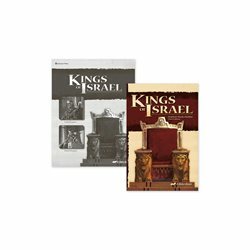 The Hebrew History Video Student Kit follows the kings of Israel and the impact they had on the Israelites during each of their unique reigns. This kit includes a study outline and a quiz and test book. These two materials will provide your students with the help they’ll need to receive quality learning of the many kings and their choices that brought both blessings and consequences to the land of Israel. Combine this kit with the Hebrew History DVD Monthly Rental for a successful year!